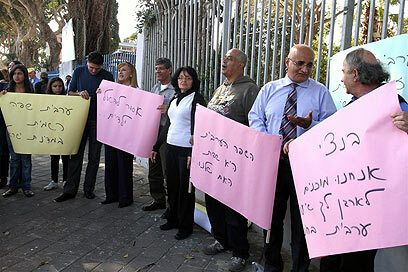 Dozens of Jaffa residents held a demonstration outside a school Tuesday protesting the fact that the school's principal prohibited Arab students from speaking Arabic inside classrooms. Students who attended the rally accused him of racism. The protest was also attended by Tel-Aviv-Yafo councilman Ahmed Masrawai who slammed the principal's decision noting that Arabic is considered an official language in Israel. "I dare you to forbid Lieberman from speaking Russian at the Knesset," he said. "We oppose classroom disruptions, whether it be by Arab or Jewish students, but such a guideline cannot be issued to Arab students living in an integrated city." An Arab student at the school claimed that the decision reflects growing racism in the Israeli society. "Just as the principal asks students not to speak Arabic he should demand they not speak Hebrew. He cannot act as a dictator and declare only Hebrew is allowed, the Arab students should be taken under consideration too." Another student said that the principal himself came into the classroom and asked the Arab students not to speak in Arabic. "I thought he would have another way of talking to us as students instead of humiliating us. A responsible party should step in and interfere." Tel Aviv associate mayor Meital Lahavi said that the municipality was not aware of the new guideline and that it learned of it only two days ago by Mashrawi. "I came to the school to say that the issue of Jaffa's integrated schools must receive attention and that Jewish students cannot be favored at the expense of the Arab students. 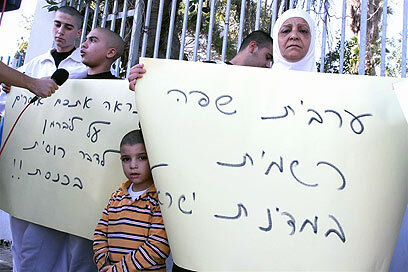 All populations in Jaffa must be respected," she said. No comment was received from the school principal. See all talkbacks "School principal prohibits students from speaking Arabic "